Tutorial How to fix "no bootable device – insert boot disk and press any key"
If your computer won't boot,and you are seeing a no bootable device – insert boot disk and press any key notification, then you can follow the below guide to fix your computer. Make sure you get the same version you have installed: 32 or 64 bit; Home Premium, Pro or Ultimate. STEP 1 : Turn your computer on, booting from either your Windows 7 Installation DVD or Windows 7 System Recovery Disc. Remember, you may need to change the boot order inside your BIOS to have the your DVD drive boot first. STEP 2: After the installation or recovery disc loads, if prompted, select your language settings and then continue. If you are using the installation DVD, when prompted by the following screen select Repair your computer. STEP 3: The computer will take a moment now to scan itself for any Windows installations, after which you will likely be given a choice to select which installation you wish to repair. Select the appropriate Windows installation from the list and then continue. If by chance a problem is detected in one of your Windows installations at this initial stage, the system may also ask you if it can try to repair the problem automatically. It is up to you if you wish to let the system try to repair itself, but otherwise just select No. 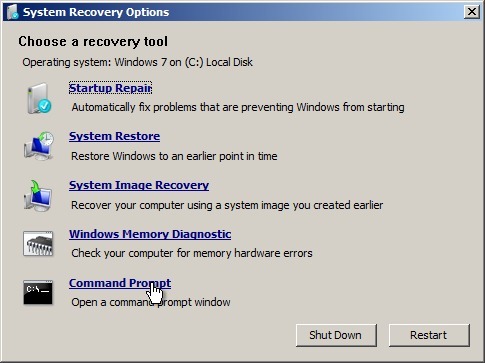 STEP 4: Once you have reached the System Recovery Options screen, as shown below, you will be faced with a list of choices that can aid you in repairing a damaged Windows 7 operating system. If you wish to try the Startup Repair option first, it is often successful in automatically fixing many different start up issues, but in this article we will be using the Command Prompt option to resolve our problems manually. So, click Command Prompt to continue. If successful, you should be greeted with the message The operation completed successfully. That’s it! Your Master Boot Record has been repaired. Upon purposely changing the active partition on my system drive, I was faced with a BOOTMGR is missing error during my system’s start up that prevent Windows from starting. It is a common mistake to make when playing with partitions on a system drive and it can be a headache to solve if not prepared. 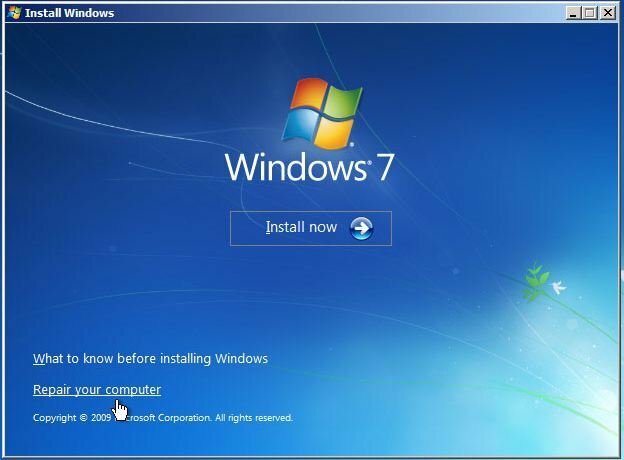 To change your active partition back using the Windows 7 recovery disc or Installation DVD, follow the steps below. STEP 1: Follow steps one to four in the above guide. This should take you to the Command Prompt in the Windows Recovery Environment. STEP 2: Type DiskPart and then press Enter. STEP 3: Type Select Disk x, where x is the number for the disk containing the partition you wish to make active. Press Enter. STEP 5: Type List Partition and then press Enter. You will now be shown a list of the partitions on the selected disk. Determine which partition you wish to make active. You’ll see a list which will display your system partition. STEP 6: Type Select Partition x, where x is the number of the partition you wish to make active. STEP 7: Now, just type Active and then press Enter. That should be it – the selected partition is now active. YEAH!!!!! Great help for all! Thanks Jack! I was following your directions to remove file recovery virus and after running hitman pro I get the no bootable device error. I am using a netbook and have no startup disk (and no cd drive at all in fact). Any idea how I can fix this? Go ahead and follow this guide...It should work without any problems. The 3 above i've seen before on my computers and normally i'd just re-install windows so thanks for this tut. Do you have a Windows 7 ISO file? If yes, just use this tool to make it bootable from USB. If you dont have ISO files, I dont know if I can post links to them. They are unactivated BTW. Thank you for trying to help, winandlinux tutorials. I went ahead and bought the windows 7 recovery cd as well as a CD-ROM drive, but when I boot with this disk, the only option is to reformat the hard drive and erase all my files, which I really would like to avoid if possible. I don't have a repair option that doesn't involve deleting my hard drive content. Any ideas? Two days of trying non-working solutions and came across your post and followed steps and worked first time...I wish just about ready to call it quits and reinstall ..Thanks Much! Excellent guide, but in order for you to be able to boot from DVD you will have to make sure that your BIOS is setup where your first boot device is DVD/CD ROM. A lot of the newer systems have their first boot device setup for USB Media as default in their BIOS and their second boot device for hard drive. Ok after having the Unmountable Boot Volume BSOD, no way I can use the repair console within windows. So I have boot from the DVD, and currently in command prompt. Now this is where im stuck. I did a bootrec.exe /fixmbr and /fixboot but still no luck. I will now attempt the chkdsk command but cant remember if this one is right: chkdsk /R C: or chkdsk / R C (i have 3 partitions, 1 OEM, 1 Recovery and One which is the OS. The only drive is C drive. any ideas if that is the correct command? Edit: C; points to Recovery... So i can assume it will be D the actual OS partition? I assume you are on Windows 7. Reboot for it to check/repair hd. You should be able to boot back into Windows. staring again at the blue screen waiting for the window to access command prompt. patience running low now temped to go for a full format and start from beginning of instalation. Was able to launch the repair console within windows, did a chkdsk /r d: and once again stuck on a %, but this time went further, so cancelled, did a fixboot and finally able to get back into windows to schedule a proper chkdsk on boot. When I get to step 4, nothing shows up in the box. From there, the command prompt and everything goes wrong. Please help, I really need that computer. If nothing works, how can I find what model of harddrive should replace it? Can you get at the Command Prompt?If yes,please follow the below instructions. At the System Recovery Options screen, make note of the drive letter assigned to your boot drive (normally C: ) and click Next. Nothing shows up at the system recovery optionsscreen, just a window saying there is an error and when I try to fix it, it results in an error. At step 4, the box is blank and a window offering repair pops up, but it fails and says there is a problem with the hard disk. Help I've followed the instructions above from the beginning and am currently looking at the System Recovery Options. I selected the top option buy do not get any operation system to show up. Any suggestions? You wont get a Operating system rolsen. What you get is black screen with some text and a cursor, it is called command prompt. If nothing works try a sfc/ scannow from the command prompt. Tutorial [Video] How to make a bootable ISO for Windows XP, Vista & 7?